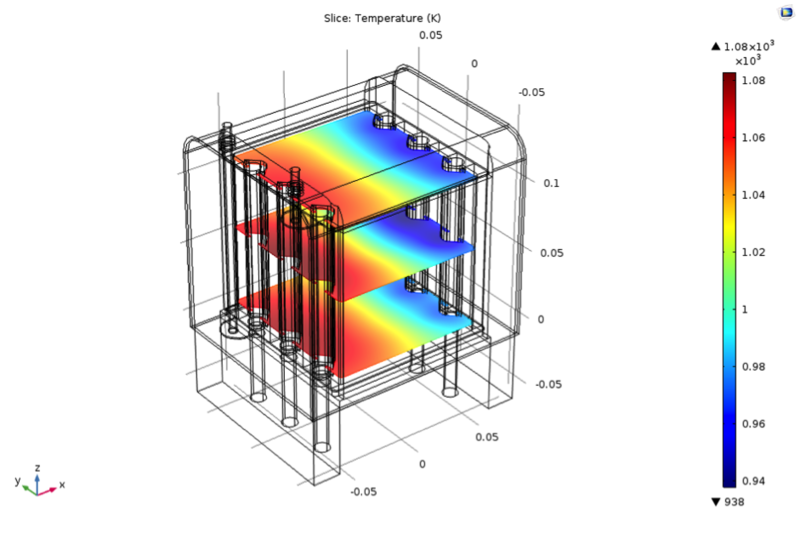 Today, guest blogger Matteo Lualdi of resolvent ApS, a COMSOL Certified Consultant, discusses the benefits of creating a simulation app to analyze a solid oxide fuel cell stack. For many businesses, numerical modeling and simulation are valuable tools at various stages of the design workflow, from product development to optimization. Apps further extend the reach of these tools, hiding complex multiphysics models beneath easy-to-use interfaces. 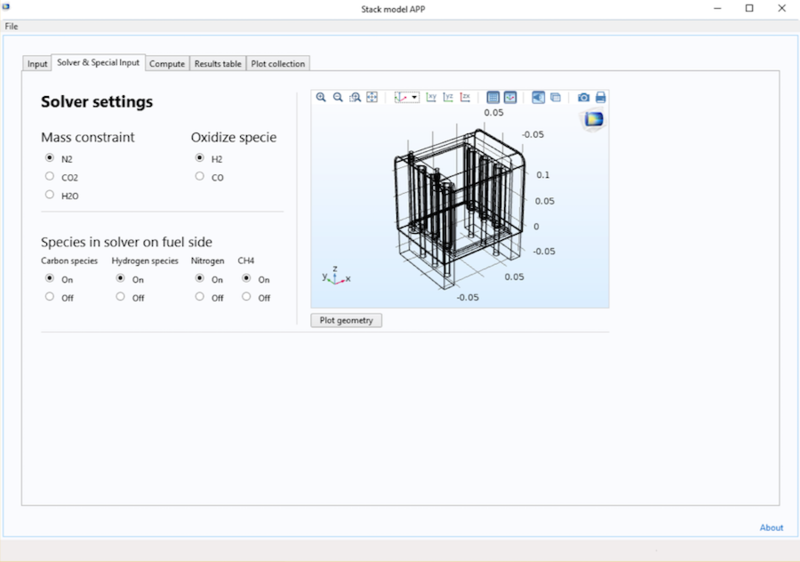 Here’s a look at one such example: a solid oxide fuel cell stack app. Consider a device that can generate heat and power for your home as well as power the electric motor of your car. Now think about using such a device to produce electricity with small losses, without being limited by Carnot efficiency. The thought that should come to mind is a fuel cell. 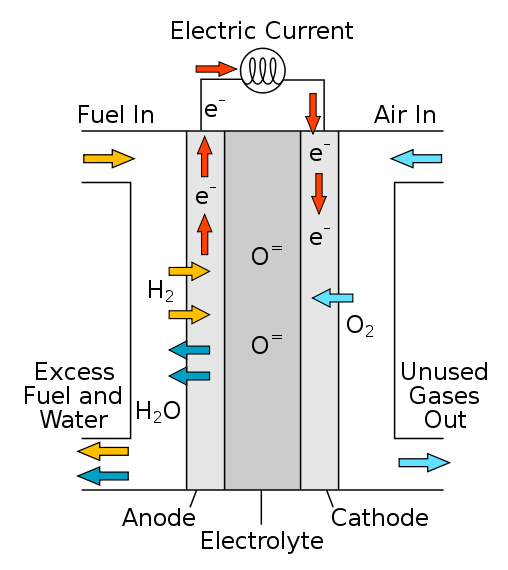 Fuel cells, like batteries, are devices that electrochemically convert chemical energy present in the fuel into electrical energy. But unlike batteries, which have to be recharged, fuel cells are continuously fed with chemicals. Solid oxide fuel cells (SOFCs), in particular, are recognized as one of the most efficient and flexible types of fuel cells. This is due to their very small kinetic losses, despite the slightly less advantageous thermodynamics at higher temperatures. However, from an engineering point of view, these devices present more of a challenge due to their high operating temperatures (600°C to 1000°C). A schematic of an SOFC. Image in the public domain, via Wikimedia Commons. Because of these high temperatures and the overall complexity of the system, measuring critical parameters like temperature, composition, and current densities within the stack is quite difficult. However, addressing such elements is particularly important in optimizing the performance of the device and identifying any potential issues that occur at different operating conditions. With the capabilities of the COMSOL Multiphysics® software, it is possible to achieve precise estimates of such parameters. 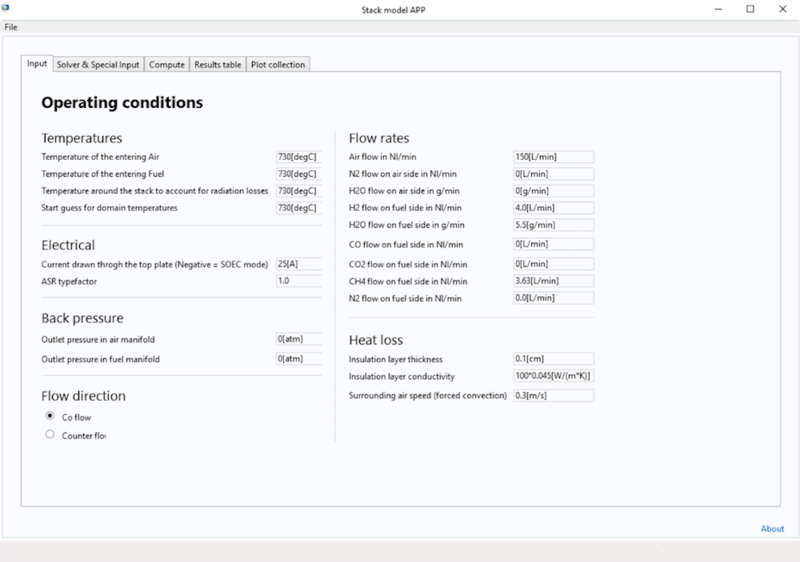 The software also helps with the interpretation of experimental results and enables users to virtually perform potentially destructive tests, which can otherwise be quite expensive and difficult to fully understand. 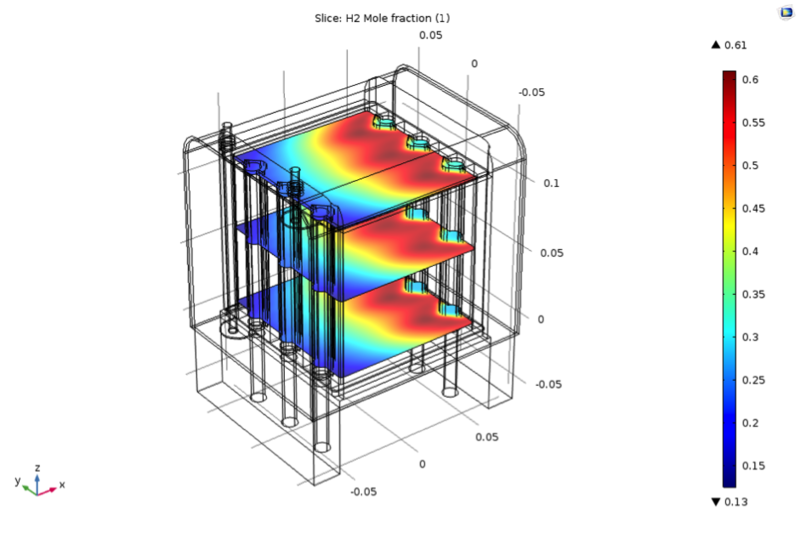 Modeling an SOFC stack requires combining a rather intricate geometry with large aspect ratios and multiple physics in a 3D problem. Each SOFC features two reactant flows: air and fuel. These two elements can have different compositions and several parameters that describe inlet and environmental conditions. 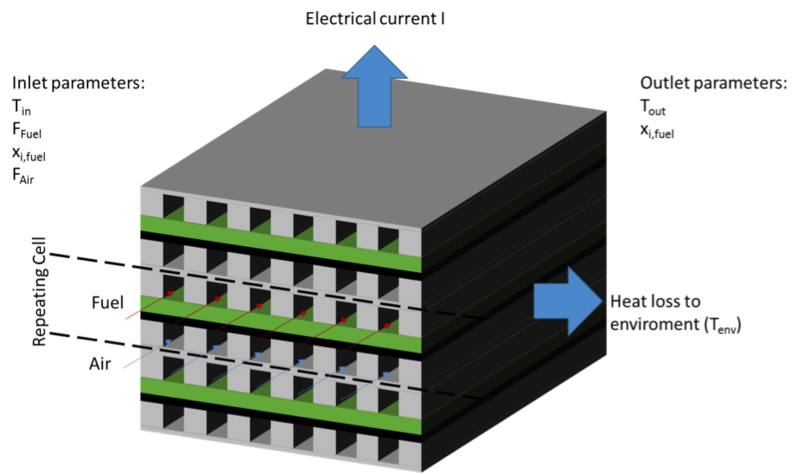 Model geometry of an SOFC stack. Designing this complex model and modifying its parameters requires knowledge about both technology and mathematical modeling. The combined expertise needed to run such calculations often translates into a heavy workload for the model developers, who have to dedicate a great share of their time to run calculations. Now, thanks to the Application Builder in COMSOL Multiphysics®, simulation experts have the ability to design a user-friendly tool that can be deployed to other team members and throughout an organization to study such complex systems. This can greatly improve overall productivity by delivering simulation results more quickly to users, while giving simulation experts more time to focus on model development and, of course, to continue to provide assistance with simulation strategies along the way. Like the initial model highlighted above, the app presented here was developed at Topsoe Fuel Cell, a leader in SOFC technology. 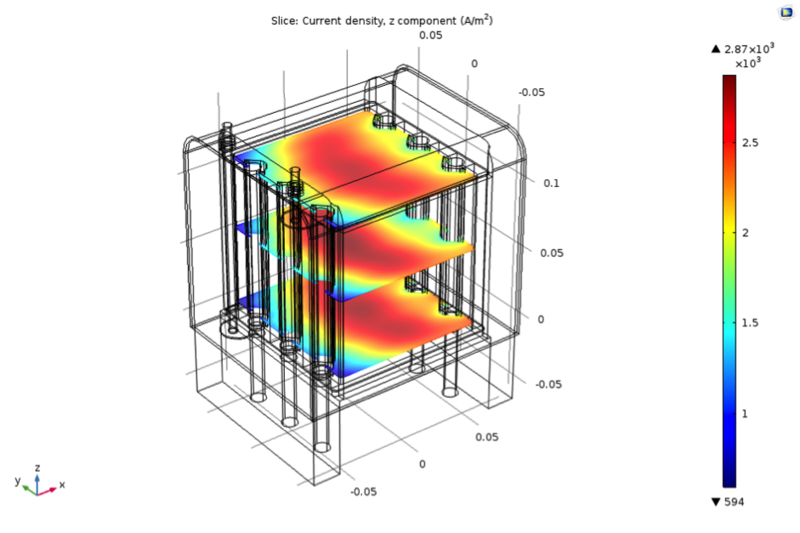 Both the model and the corresponding app have served as an important development tool throughout the organization for advancing the design of SOFC stacks. The app’s user interface (UI) features several tabs, as highlighted in the following series of screenshots. Under the Input tab, for example, users with little to no simulation expertise can easily modify several operating conditions for the SOFC design. In this case, such conditions range from temperatures and currents to flows and heat losses — parameters that can be updated based on the specific modeling needs. Parameters available for modification under the Input tab. Perhaps an app user does have knowledge of the solver and other special settings. If so, under the Solver & Special Input tab, these users can modify various elements related to the solver, including mass constraint, the oxidized species, and the different species in the solver on the fuel side. There is also the option to make adjustments to the settings that pertain to the area-specific resistance (ASR). The Solver & Special Input tab. After applying the appropriate changes to the settings, the next step is to compute the simulation. While doing so, app users can follow the progress of the simulation as they await the results. So what types of computations can users perform with this tool? For one, the app can be used to compute the temperature distribution in the SOFC stack, as shown below. Temperature variation in the SOFC stack. With the app, users can also analyze the current densities of the SOFC stack as well as the hydrogen mole fraction. You can see such simulation results highlighted in the following plots. Left: Plot showing the current density. Right: Plot showing the H2 mole fraction. As the design workflow progresses and users obtain a better understanding of their device, they may request to change or include new input parameters and outputs for analysis. With the flexibility and customization available in the Application Builder, it is easy for app designers to make these modifications and thus meet the specific needs of their end users. Turning a complex model into an app is a powerful solution for bringing simulation capabilities to a larger number of people. Whether deploying apps to other engineers, system developers, or salespeople at your organization, these tools serve as a viable resource in helping to deliver reliable simulation results quickly to verify operating strategies or provide some insight into experimental results. From a consultant-to-client point of view, a design workflow that includes an app based on a validated model creates a greater value for clients. Rather than receiving a report with only a few sensitivity analyses, they have the power to investigate the impact of various parameters on their design and therefore achieve faster and more reliable results. 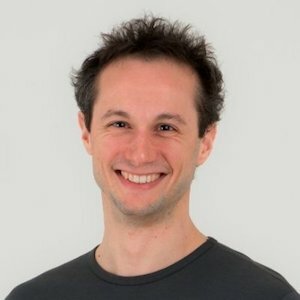 Matteo Lualdi is the simulation manager at resolvent ApS, a COMSOL Certified Consultant. He received two master’s degrees in energy engineering from Politecnico di Milano and the Royal Institute of Technology in Stockholm within the Top Industrial Managers for Europe (T.I.M.E.) framework. Matteo later earned his PhD in chemical engineering from the Royal Institute of Technology. His experience prior to resolvent ApS includes working in the fuel cell and catalyst business, where he was responsible for system simulations and catalytic reactor sizing.